Character development happens at the individual level but it is worthy of our collective investment. Educational Programs sponsored by our Masajid and Islamic Centers, and aimed at strengthening our knowledge and connection with Allah, contribute to character development. All of us who benefit from the services provided by our Masajid and Islamic Centers have a collective responsibility to lend our support to ensure they remain relevant and effective. Come join us for an uplifting and enlightening evening to learn more about MCCGP and ways in which you can lend your support. Saturday February 28, 2015 at 5:30 PM. 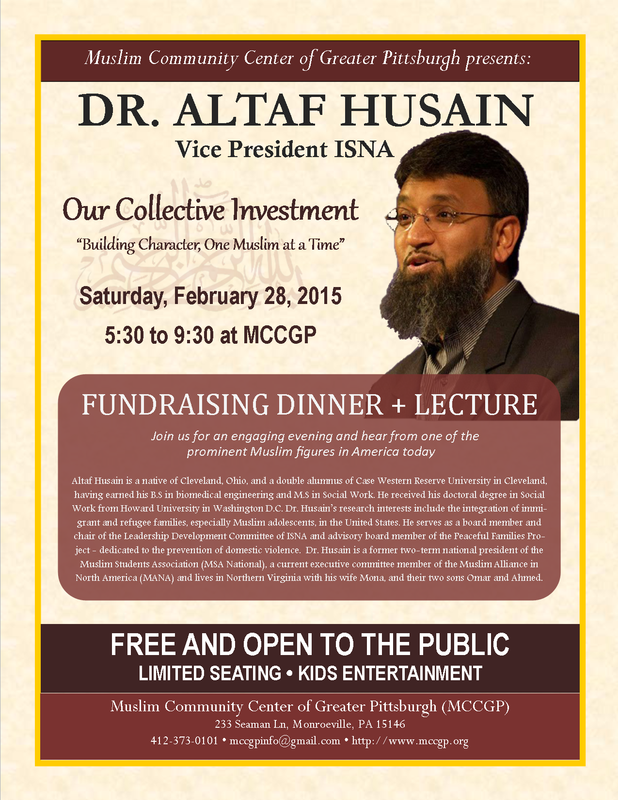 Dr. Altaf Husain, our keynote speaker, is the current Vice President of Islamic Society of North America (ISNA). He is an accomplished professional who has been very active at the national scene and holds a special interest in Muslim adolescents. He is a two-term national president of Muslim Students Association (MSA) and sits on the boards of the Leadership Development Committee of ISNA and Peaceful Families Project (dedicated to prevention of domestic violence). Please join us to hear from one of the prominent Muslim figures in America today. The dinner is open to all. We also have special activities for kids. For more details, please see the flyer.